I’ve been sick with a cold for the last few weeks, which means I’m in the right mood for some good crime fiction. (Is it weird that I use crime fiction for comfort reading?) 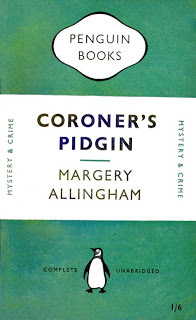 And these days, when I want crime fiction, I’ve been turning to Margery Allingham, whose Albert Campion novels I’m attempting to read in order. No longer the madcap adventurer of the earlier books, this Campion is a war-weary agent, back in London on leave from a secret mission in the last days of the war and wanting nothing more than to catch a train and get home. But when he stops off in his Bottle Street residence for a quick bath, he finds a body in his bed, brought there by his manservant Lugg and two rather striking women. The whole business is more than Campion wants to deal with, so he leaves Lugg to handle it and heads off to Euston Station to catch his train. Unfortunately, a taxicab abduction keeps him from the station, and when the police get wind of the situation, they forbid him from leaving London. So he’s left solving a mystery in spite of himself. Campion’s doesn’t do a lot of actual detection in this book—the mystery seems to come to him. He gets invited to the right places and talks to the right people and is naturally curious enough to ask the right questions. The mystery involves one of another of the tight circles of eccentrics that tend to populate Allingham’s novels. In this case, it’s the household of the aristocratic Johnny Carados. The dead woman was initially found in Carados’s house, and his mother and fiancée are the striking women Campion found in his own home with Lugg. As is usual with Allingham’s novels, the mystery, while sufficiently engaging on its own, is also a vehicle to consider other, larger themes, such as the way war affects a city and its people. Campion has been away from London for three years, and the war-time city is a strange place, populated with familiar characters in new circumstances. People are finding new ways to survive and sometimes to make a profit in this changed environment. And people who appear self-absorbed show themselves to have hidden levels of consideration and care for others. All of this is deep in the background—the focus in on the mystery—but these ideas pop up often enough to give the book a feeling of seriousness, especially given that it was published in 1945, when people were in the midst of grappling with these changes. This is a solid mystery, well-written and enjoyable. The ending is probably the most striking element of the book, but I won’t spoil that for you. I have laugh when you say you find a good crimi relaxing. I have to agree. Plus, the post war is so utterly dark. Dare I mention Foyles War or The Hour? Yes, it is film but a grand look at the grim reality of the new morality of the mid 20th Century. Thanks for the lovely review. Campion is next! I saw a couple of seasons of Foyles’ War any enjoyed them, but it’s been ages. I’m looking forward to watching some of the Campion series–Peter Davison seems perfect for the part! Having a cold drag on like that is awful – I’m glad this provided some distraction. Mysteries also count as comfort reads for me, though for that I definitely prefer the cozier end of the crime spectrum. I once got through a series of medical tests with Elizabeth Peters. The ending of this one is what I remember best about it! I’ve forgotten much of the plot. I keep meaning to re-read some of the earlier Campions. The dragging on is terrible. I only felt really awful for about a day and a half, which is lucky, but I haven’t felt normal for weeks. The early Campions are a lot of fun because he’s such a wacky character, but I’m looking forward to some of these more serious ones now. I hope you throw off that cold soon – horrid to have it for so long. I also treat ailments with crime: I think there’s an element of predictability that soothes the fevered brow! I finally went to the doctor a few days ago, so I think I’m on my way to being fully well. I do think it’s the predictability in style and tone and usually even outcome that’s soothing. 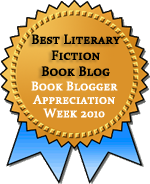 I can’t believe I’ve never read a Margery Allingham mystery – I’m not even sure I have any lurking. I really ought to read some of her Campion books. I hope you’re back to full strength soon. I’ve been enjoying them very much, and I’m usually not much for cozy mysteries. I think they’re just for enough on the adventure side of the cozy spectrum to suit me. I’m another who turns to crime fiction when I’m not feeling at my best and also another great Allingham fan. I hadn’t thought about trying to read then in order probably because when I first discovered her her books weren’t in print so I had to take what i could find. Now that they’re available again I must think about getting a collection together for a Christmas treat. I hope your cold soon clears up, they are so debilitating when they drag on. It took me a while to gather up enough of them to start reading in order. They’re not easy to find here! But my library starting getting some of the Felony and Mayhem reprints, which has filled in the gaps. it has been neat to see the character and Allingham’s style evolve. I needed some comfort reading myself this weekend and plumped for The Clue of the twisted Candle by Edgar Wallace. You’ve reminded me that I haven’t read many Campion novels, this sounds like a good one. I’ve never read any Wallace. That’s one good and not-so-good thing about crime fiction–there’s a never-ending stream of authors to try. Sorry to hear you are under the weather but it sounds like you found the perfect book to help you through. Hope you are feeling better soon! I think I’ve turned a corner and am feeling much better. Finally giving in and going to the doctor for serious medicine did it! Oh no for your cold! But like you, I turn to crime fiction even more when I’m not feeling well. Love it. This sounds so good, and I’m shocked I haven’t heard of this author before. Adding to my list now, thanks. It’s strange that Allingham isn’t more well-known today. I always think of her as one of the grand dames of the Golden Age, but I think when her books went out of print, she lost a lot of popularity. I wanted to sympathise over your cold! I’ve had a throat bug for about three weeks (going now), and these things drag a person down. Hurray then for Golden Age crime, which always lifts my spirits. You remind me that I haven’t read a Campion in a long time and that I should. Allingham can be patchy, but she’s still a great storyteller.